There are a lot of breweries and brewers in Portland. Not such a big secret, eh? What some people may not know is that the brewing community is relatively tight knit. Most of these folks know each other, which presents the opportunity for friendships and rivalries at the same time. 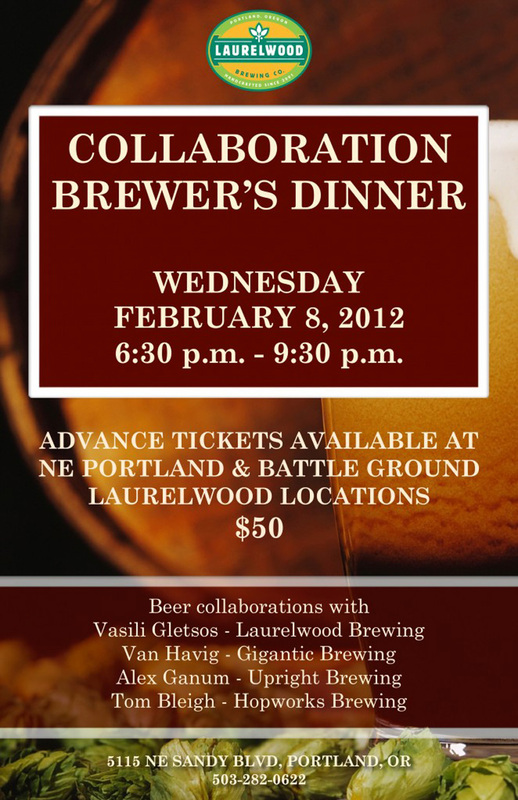 Last week's Collaboration Brewers Dinner at Laurelwood on NE Sandy was an opportunity for several brewers who know each other well to show off what they can do. The collaborators, Vasili Gletsos (Laurelwood), Van Havig (Gigantic) Alex Ganum (Upright) and Tom Bleigh (Hopworks), know each other from past brewing gigs. For the record, this isn't the first Brewer's Dinner they've held at Laurelwood. It is, however, the first one I've been to. The idea behind these events is to pair beers with appropriate foods, similar what you see at a vintner dinner with different wines served with different courses. Beer can work very well this way, contrary to what some people think.Yeah, I've heard the snickers. I want to note that Laurelwood's physical space does not set up perfectly for an event like this. If you've been there, you know why. Instead of a large room where there's a shared ambiance, diners sat in three separate areas: bar section, main section, west section. This isn't ideal, though it also isn't a deal killer. The menu for the five-course dinner was put together by Laurelwood Chef, Aaron Nichols. There was certainly significant coordination between Nichols and the brewers to see that the planned beers and planned foods matched up. Great line-up. 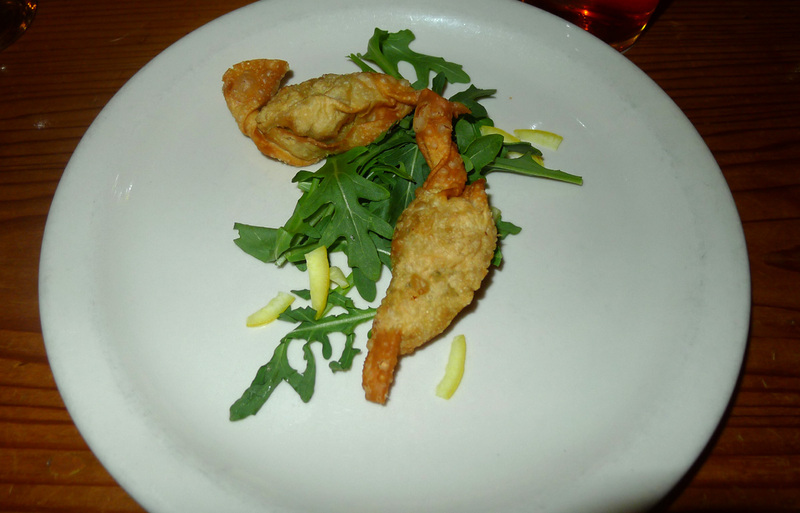 The first course was chicken coronets served with preserved lemon. Very tasty, slightly spicy. 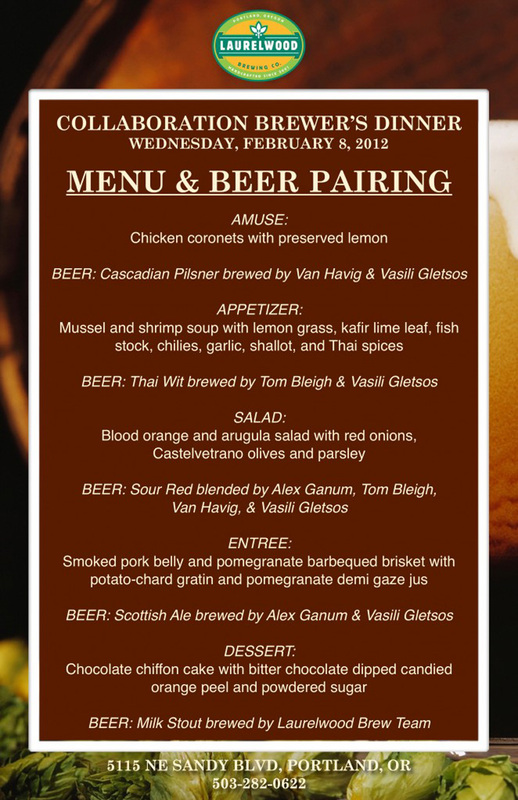 The beer pairing, a bold Cascadian Pilsner brewed by Gletsos and Havig, was excellent. This beer, born from German base malts and neutral lager yeast, leaned heavily on several hops to create a firm, but not overly aggressive Northwest hop character. I'd like to see this beer on tap somewhere...anywhere. 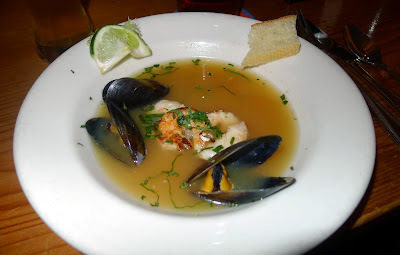 The second item was a shrimp and mussel soup with lemon grass, kafir lime leaf, fish stock, chilies, garlic, shallot and Thai spices. It was tough to get a bead on the soup because it was lukewarm when it arrived. Everyone at my table agreed. The mussels were terrific. The shrimp were okay. Otherwise, nothing stellar. The beer pairing was a Thai Wit brewed by Bleigh and Gletsos. This is a delicate beer and it went well with the soup. However, it seemed out of place behind the very bold Pilsner served in round one. Food for thought. This was the best pairing of the evening, I thought. A salad combining blood orange and arugula with red onions, Castelvetrano olives and parsley was delightful. The beer, a Sour Red ale, was terrific. It was based on a Flemish style red and was several years in the making as the four brewers mixed and matched their barrel aging projects. The result was a pleasantly tart beer that matched the salad perfectly. Well done! This was the main course, a smoked pork belly and pomegranate barbecued brisket with potato-chard gratin and pomegranate glaze. The paired beer was a Scottish Ale brewed by Gletsos and Ganum. The plate could have been warmer, but the pork and other items were quite tasty. The beer was overtly smokey, possibly related to the sour served in round 3. Still, quite good. The initial menu for this event listed grapefruit tart and pecan brittle as the dessert. Several people at my table noted the change, for which there was no explanation. Anyway, the replacement was a chocolate chiffon cake paired with a Milk Stout. The cake went well with what I would call a mild stout. It was a decent pairing, but it lost some mojo compared to what came before it. For my money, they served up three solid hits on the food menu: the chicken coronets, the arugula salad and the smoked pork belly. The soup was a near miss. The cake, not so much. On the beer side, the Cascadian Pilsner and the Sour Red were direct hits. I put the Thai Wit and the Scottish Ale in the near miss category. Opinions will certainly differ...these are mine. One area where they can do better is the interaction between the brewers and the paying customers. Vasili stopped by our table and talked for a minute. None of the other brewers did. This was possibly related to the way Laurelwood's space is split up, I admit. Still, people who pay good money to attend these dinners like to mingle with the guys who made the beer. Pretty simple, eh? I know what all you kids at home want to know: Was the dinner worth the $50 cost? It definitely depends on your perspective. If you like unique beers paired with inventive, tasty food items, then you're going to see the value. If that isn't your thing, this isn't your gig. Take your $50 and spend it somewhere else.